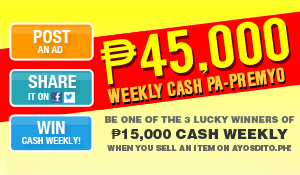 Sell an item on AyosDito.ph and WIN CASH! This is where AyosDito.ph whets the appetite of every smart shopper. 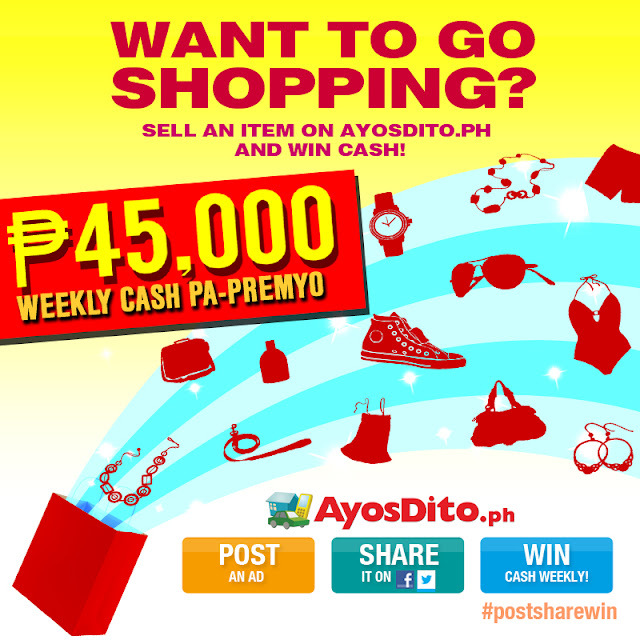 If you're looking at a prospect new bag, new pair of shoes or even a grand new haircut, AyosDito.ph brings you the chance to get those and more with the launch of their Post Share Win CASH promo! Instead of breaking the bank or setting your plastic on fire, Team AyosDito.ph invites every smart shopper to sell an item online to win cash weekly! 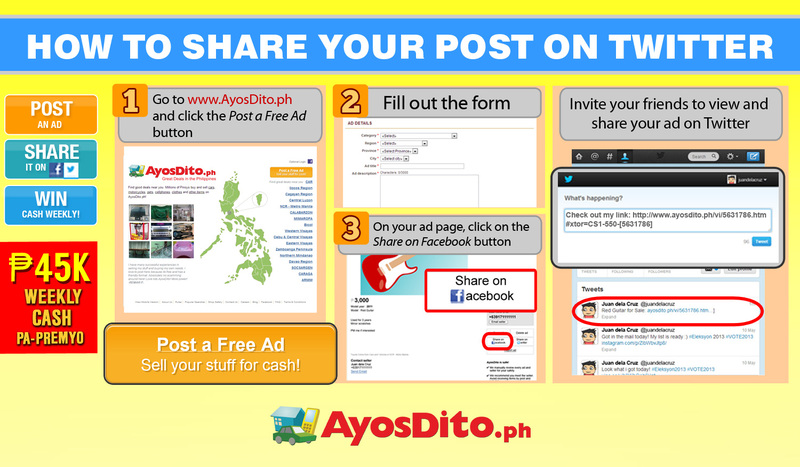 That's right, for every item you post and share on AyosDito.ph, you get the chance to win P15,000 cash every week! 1. Sell an item you don't need or use anymore. Post an ad on AyosDito.ph! 4. 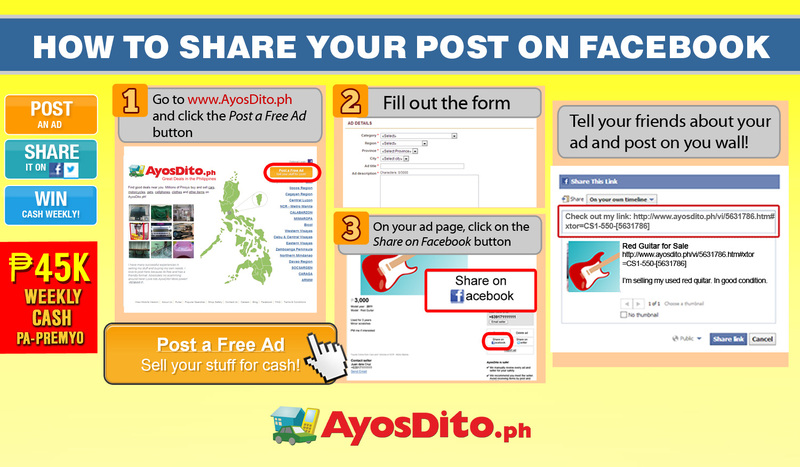 To further increase your chances at winning P15,000 every week, you can post more ads so you can share more ads online! Start selling items on AyosDito.ph and tell your friends about it! Anyway, Disney's about to unleash a contemporary surf-rock musical entitled "Teen Beach Movie" this Sunday, August 4, 10:00AM on Disney Channel. The storyline depicts how 1960s sensibilities motivate a modern girl to affirm her capability, strengths and goals. Made for kids age 6-14 and their families, the summer splash - "Teen Beach Movie" introduces confident, resilient surfer McKenzie and her carefree boyfriend, Brady, a fan of the retro surf musical movie, "Wet Side Story." On the morning of McKenzie's planned departure for boarding school, she and Brady catch one last epic wave which mysteriously carries them right into "Wet Side Story," circa 1962, where they meet Seacat, Giggles, Rascal and Cheechee, among others. Amidst the spontaneous song and dance, there's trouble in paradise -- it's bikers versus surfers for control of the local hangout, but Mack and Brady unwittingly interfere with the movie's star-crossed plot, one that would pair a surfer (teen matinee idol Tanner) and a biker (Lela, the sister of Butchy, the biker gang's leader). Typical of the teen beach movie genre, a kooky subplot has mad scientists Les Camembert and Dr. Fusion scheming to alter weather patterns and take over the local hangout -- and then the world. Directed by Jeffrey Hornaday (Disney Channel's "Geek Charming," choreographer of "A Chorus Line," "Flashdance") and choreographed by Hornaday and Christopher Scott ("Lemonade Mouth," "Step Up 4"), the movie includes retro hairstyles and make-up (by Loida Jeannot and Dominique Borrell, respectively), richly-hued vintage wardrobe designed by Oscar nominee Ruth Carter ("Amistad," "Malcolm X") and other inspirations of the '60s. The score is by David Lawrence ("High School Musical"). The production design is by Mark Hofeling ("High School Musical"). The story is by Vince Marcello (director, featurette version of the off-Broadway musical "Zombie Prom," and "An American Girl: McKenna Shoots for the Stars") & Mark Landry, and the teleplay is by Marcello, Landry and Robert Horn (writer of "Sharpay's Fabulous Adventure," writer of Broadway's "13" and writer/producer of "Designing Women"). David Buelow ("Bring It On: Fight to the Finish") is the executive producer and Robert F. Phillips ("Teen Spirit," "Valkyrie") is the producer. 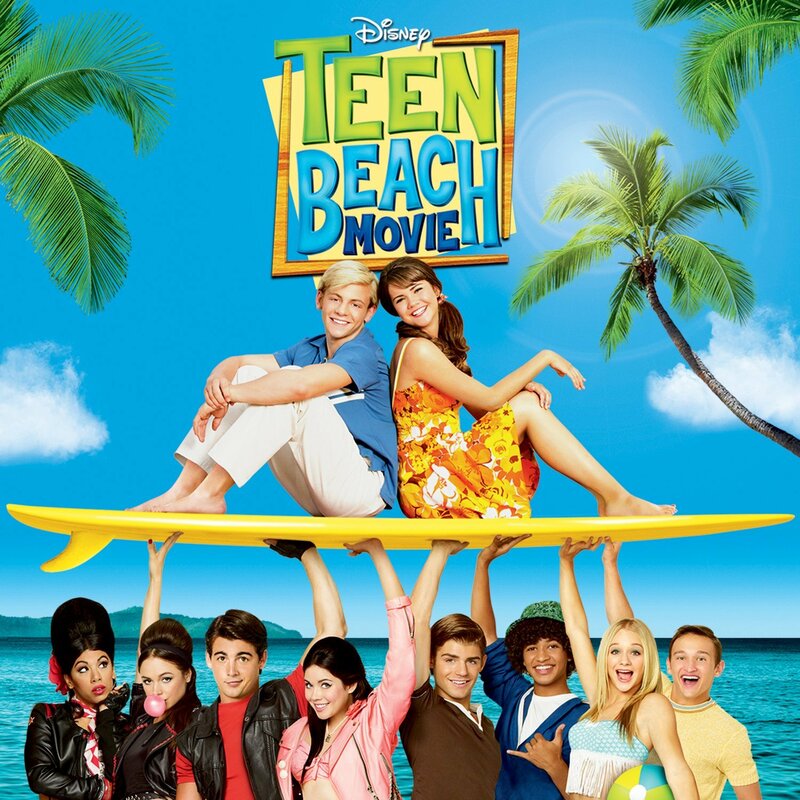 "Teen Beach Movie" is a production of Rainforest Productions, LLC. The movie stars Ross Lynch (Disney Channel's "Austin & Ally") as Brady, Maia Mitchell (ABC Family's "The Fosters") as McKenzie, Grace Phipps (ABC Family's "The Nine Lives of Chloe King") as Lela, Garrett Clayton as Tanner, John Deluca as Butchy, Chrissie Fit (ABC's "General Hospital") as Cheechee, Jordan Fisher as Seacat, Mollee Gray (Disney Channel's "High School Musical") as Giggles, Kent Boyd as Rascal, William T. Loftis as Lugnut, Jessica Lee Keller as Struts, Kevin Chamberlin (Disney Channel's "Jessie," Broadway's "The Addams Family") as Dr. Fusion and Steve Valentine (Disney Channel's "Wizards of Waverly Place: The Movie," Disney XD's "I'm In The Band") as Les Camembert. Suzanne Cryer is Aunt Antoinette and Barry Bostwick makes a special appearance as Big Poppa. Classic gold, grey and silver, romance of florals, teals and cutting-edge metal accessories for the ladies and denims plus shades of blue, brown and black for the gents! Don't you just love the Pre-Fall Collection of SM Accessories? You'll surely be captivated by the upcoming pieces of our favorite fashion authority! Icons Xian Lim, Georgina Wilson, Richard Gutierrez and Anne Curtis are the stars for this quarter's campaign and they have hand-picked some pieces from SM Accessories. Definitely excited for these beautiful jewelries! They'll be available soon so make sure to visit SM Accessories at SM Stores nationwide! Aside from coffee, internet or a good book to read, our best friend for this rainy season (and all other seasons actually) is music. You can further enjoy listening to your favorite songs with Urbanears, as they're offering 50% discount on their Tanto headphones. 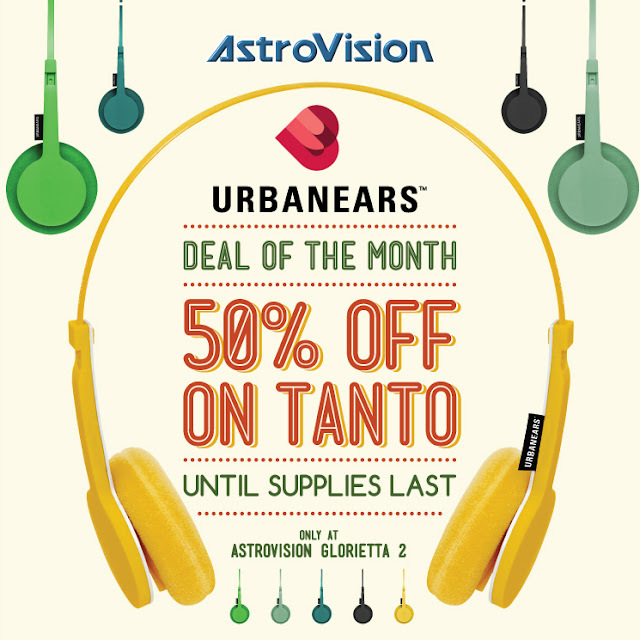 This promo is only available at Astrovision Glorietta 2 until supplies last. Before, rainy season entails dark, dull and dreary clothing. The world of fashion exclaims a whole different story now. What we need are pops of fresh colors and prints to brighten up our looks in this not-so-bright weather. One of our most-loved brands, Freeway, can give you what you need! Florals are taking over as Freeway brings out a special collection featuring its own exclusive prints exuding the perfect balance of femininity, charm and allure. It consists of tops and dresses featuring simple silhouettes and styles with stunning prints made out of soft, loose and flowy material, all with that comfort stretch component. The prints are comprised of blossoms with a watercolor and painting effect, seemingly comparable to wearing a beautiful collage of roses, tulips, orchids and more on a canvass. As for the colors, a mixture of sweet colors such as pink, blue, yellow, red and green are used, very much like the hues you see on a beautiful garden. As for the footwear, complementing the collection’s soft and feminine theme are lovely shoes from Janylin and Muñiz. This collection will surely add sunshine to your wardrobe, ready to chase away a gloomy day! Definitely something women can wear and style on a day-to-day basis whether in the workplace, a day out with friends, or on a romantic date night, Freeway's own exclusive Mixed Prints Collection embodies the qualities an empowered and graceful woman possesses. Catch the Mixed Prints Collection at Freeway stores nationwide! For more information and updates, visit freewayonline.com.ph, like their Facebook page and follow them on Twitter/Instagram @FreewayOnline.